Nosy neighbors peeking over that unsightly fence? Looking for a little less noise and a little more seclusion in the yard? There is an easy solution: trees. Trees add beauty, fresh air, and that precious privacy to your backyard space. Whether it’s afternoon sunbathing or an al fresco dinner party, your yard can become your refuge with just a few trees best suited to this thrilling planting endeavor! Wet your gardening chops or ask for assistance at your local horticulture shop and plant some of these superb trees to get that privacy for which you’ve been searching. 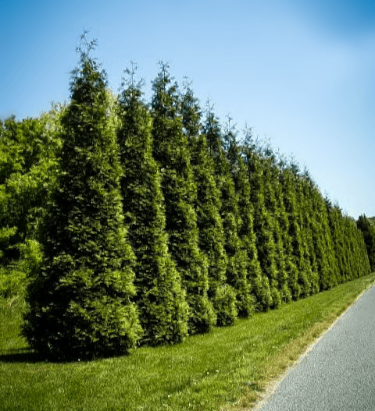 Most trees can provide shade, but in order to obtain that concealed sensation in your backyard you will want to plant trees that provide both vertical and lateral coverage. You won’t have to search through catalogs or tromp through fields of tree types, though. If you’re looking for the right kinds of trees to plant along your yard’s perimeter, look no further than here. You’re most likely familiar with Thuja Green Giants already, though you may not know it. Green Giants are luscious, evergreen trees that border many properties for the same reason you are reading about them now: privacy. Green Giants are quickly becoming the most popular perimeter plant because they are easy to care for, cover large landscape areas, and can grow close together to form a screen to secure your isolated backyard. Besides its excellent privacy benefits, the Thuja Green Giant is extraordinarily easy to grow. Green Giants can grow between 3 and 5 feet a year, meaning they will quickly provide you your backyard secrecy. Drought tolerant, disease resistant, and adaptable to many different climates and soil types, the Green Giants double as classic French countryside décor and privacy providers. Green Giants are tough, too. Don’t worry about spraying or pruning these terrific trees; just plant them about 6 feet apart and they’ll quickly earn you a concealed backyard. The Leyland Cypress is another evergreen that can provide you your desired seclusion. Although similar in many respects to the Green Giants, the Leyland Cypress is a bit pickier in its growing range. Despite its more southern restrictions, Leyland Cypress is the most popular privacy tree in the United States. The Leyland Cypress grows best in the South, West, and Northwest. Not only will the Leyland grow 3 to 5 feet a year, but it will surround your yard in soft, beautiful, feathery greens that grow uniformly and symmetrically. Your Leyland Cypress will grow to heights between 40 and 60 feet, and widths between 8 and 12 feet, so be sure to plant them about 6 feet apart. Although these drought tolerant trees prefer full sun, they can grow in partial shade as well. Almost any soil can foster the growth of this beautiful privacy plant. The Emerald Green Thuja is a smaller cousin of the Thuja Green Giant. These elegant evergreens only reach between 8 to 12 feet, so they are a great choice if you’re looking for a tighter barrier to fill. Plant these about 3 feet apart to grow a uniform, beautiful, and smooth backyard screen to protect you from prying eyes. 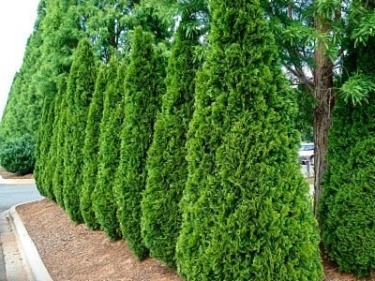 The Emerald Green Thuja is true to its name: the emerald green will sparkle in the sunlight and brighten your backyard. These thick evergreens will form a solid wall along your yard’s edge, and an attractive solo plant in pots by the front door. You won’t have to put a lot of effort into these, either. The Emerald Green Thuja can provide you a private backyard without the hard work of constant pruning and trimming. 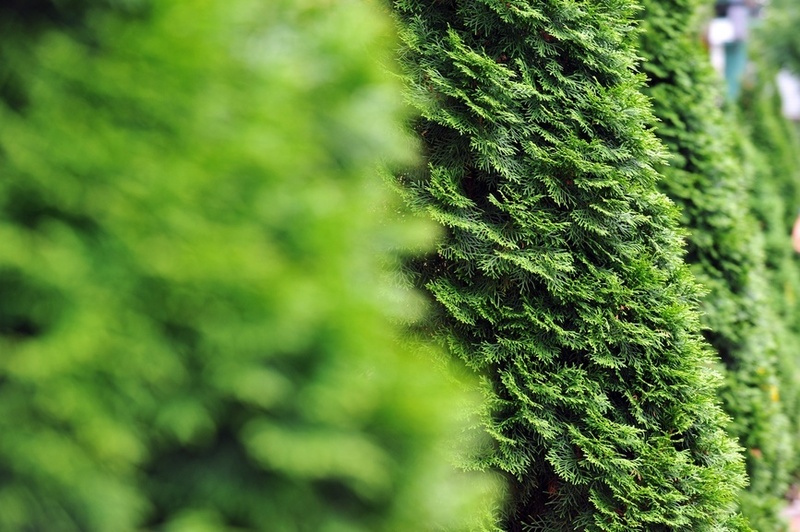 Many privacy trees grow to be quite large; the Emerald Green Thuja is a great option for those with a smaller space. Perhaps you’re looking for something outside the evergreen family. Consider the stunning American Willow Hybrid as your seclusion secret. The Willow Hybrid is not an evergreen, but it will grow into a luscious and full border plant quickly. Growing up to 6 feet a year, this Willow tree will hide unpleasant sights like highways and commercial buildings from your property. Not only will you enhance the value of your home, but you’ll also enjoy the beautiful view of these gorgeous trees. The Willow Hybrid grows easily throughout the United States, and is adaptable to many different types of soil. If planted in rows, the tree will grow between 35 and 45 feet tall and 20 to 30 feet wide. Individually, the Willow Hybrid can reach up to 75 feet in height, easily earning you the privacy you deserve. Now you might only think of holly as wintertime mistletoe, but the American Holly is a stunning privacy tree that can add a touch of color to an otherwise monotone border. This award winning tree is disease and pest resistant, and forms a hedge when planted between 4 and 5 feet apart. Unlike many of the other best privacy trees, the American Holly does require minimal trimming and pruning, but this task is easy to do and is well worth the reward of a stunning border hedge that will keep your yard private. The Pennsylvania Horticulture Society adorned this hardy tree with the Gold Medal in 2001 for its ability to grow in a variety of environments. Although extraordinarily adaptable to soil conditions, the American Holly grows best in the lower Northeast, the South, the lower Midwest, the West, and the Northwest. In the spring, the American Holly will bestow upon your gardens lovely white flowers. In the winter, prepare for the stunning red berries that are a staple of American wintertime. Your privacy is important! Let the beauty of nature enfold you and your home in the sweet serenity and peace of a secluded space. Order one of these spectacular plants today. They’ll grow quickly and with ease, provide you the privacy you desire, and save you the hassle of ordering an unwieldy fence. Visit your neighbors in the front yard; let the backyard be your own. Your best bet is Thuja Green Giant – fast growing and tough. Since it will grow 3 feet,or even more, a year, it is the nearest thing to ‘instance fence line’ you will find. Plant 3 feet apart for the quickest density, but if you plan to leave it unclipped, 4 or 5 feet apart would be better in the long run. I’m look for privacy trees to block the view of our next door neighbor dog that keeps barking and growling at my dog. Our fence is only 4 feet high due to HOA rules. Please advise as to what kind of tree is best to block the view of a dog trying to instigate yours from there lanai every time my dog goes outside. For a 4 foot hedge, you have lots of choices. 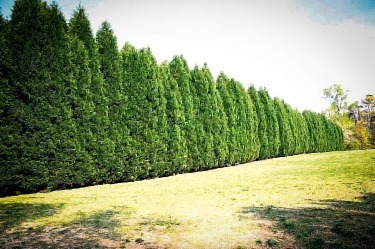 Thuja Green Giant would be almost instant if you buy 4-5 foot trees, and trim off the top. In a couple of years it will be dense and solid. You could also use American Holly, especially if it is shady where you want it. The only thing is, the dog will still hear and smell you, so it may bark anyway, especially at first! Looking for a small tree, or large shrub, to provide privacy from a backyard neighbor, who built a large shed, with windows. Neighbors yard is about 1-2 feet higher, plus, shed height, puts the windows just above 6 foot fence line, looking directly on to my back porch area. New sub-division, so not much by way of landscaping yet. Not sure I wand to cover the entire back fence line with said shrub or trees, but might. Firstly, want to prevent prying eyes from shed windows. We are looking for a privacy tree between our property and our neighbor. We would like something that will be maybe 15-18 feet tall, but isn’t very wide. Low maintenance, trimming 1-2x per year, and very wet climate in the pacific northwest. Thoughts? I’d like to plan trees all the way in my backyard to have some privacy and avoid both back and side neighbors to peak at my yard. My yard is not super huge but I have would allow some trees to be playing yes as long as the base is not too thick. I live in North California, in the Silicon Valley. Which do you recommend me to get? I have no idea who to ask or who could help me with this Thank you so much! Hi, I’m looking for a tree that will provide privacy, and will grow to 20 ft . I don’t want it taller than that, so either it has to stop growing, or I have to top it, without it growing outwards. I live in central Texas and have a longhorn ranch with lots of deer. 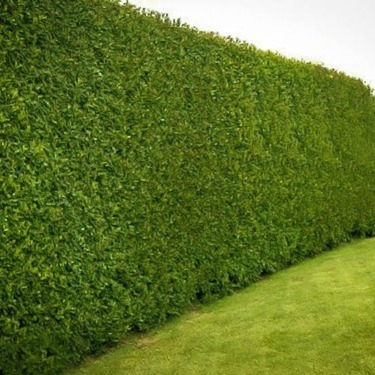 I would like a fast growing tree/shrub to create a minimum of 10′ tall perimeter privacy fence. What do you recommend? I’m looking for privacy trees that can hide my neighbors back yard, They have cut all of the trees and now they have a clear view right in to my back yard, and deck. They live in their backyard, you can’t go out to your deck or yard that you don’t see them. I live in Massachusetts. I’m in Georgia and I have a six foot fence that isn’t providing enough privacy from my backyard neighbor. We would like something Similar to the Leyland cypress but won’t take up our entire backyard (our yard is not that large) Height is mostly what we are looking for so that eventually we won’t have the view to our backyard neighbors yard. It has to be something that won’t have leaves falling. What would you reccomend? Hello. Sounds very similar to my situation. I live in a residential track home in California. All both my neighbors have 2 story homes. I am interested in a very narrow trees or shrubs that would create a natural wall for visual privacy and hopefully some sound deadening purposes. Not looking for go as high as the tops of the two story houses but tall enough to block the windows of a two story. Probably at least 15 feet high. This would be mostly for a standard 6 foot side yard with a concrete walkway. So again as narrow as possible. Not sure if trimming would be necessary. I eagerly wait for your response.